I promised a few months ago that I went to every single mall in the Phoenix and Tucson areas–and you were all quick to point out at least one omission, at an outlet mall in Mesa–but by and large I think I made it to all of them, and I plan to bring them all to you, one by one. It is happening, I swear! If we’re gonna do this, let’s start with the oldest. 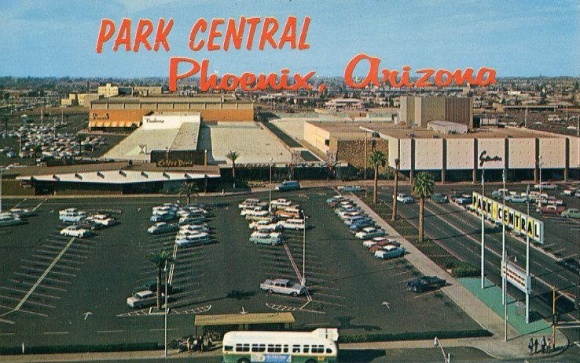 The Park Central Shopping Center opened as Park Central Shopping City in 1957, way back when Phoenix was still a fairly small city of a little over 100,000 people. 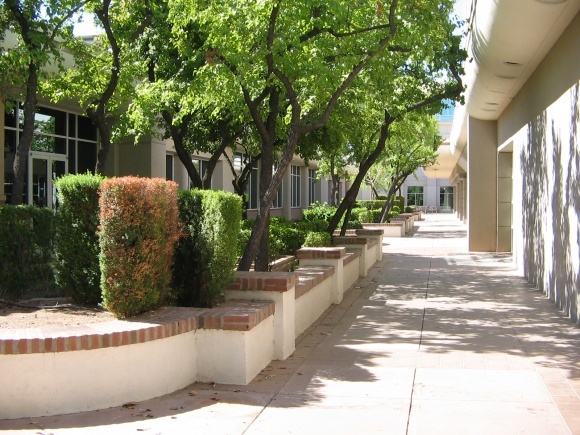 This was still the early days of air conditioning–the innovation that made places like Phoenix feasible to inhabit–and Phoenix hadn’t yet grown into the desert behemoth that it is today. 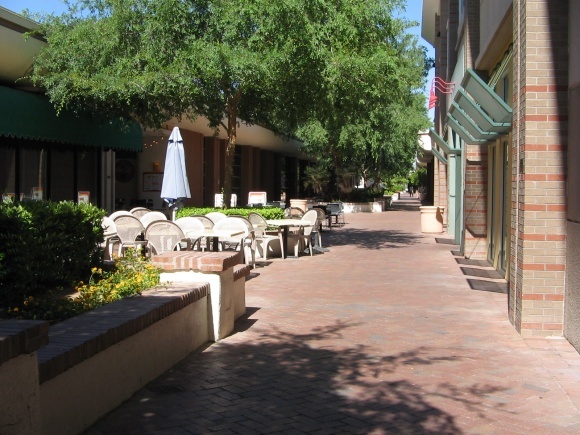 Park Central Shopping City was initially built by the Burgbacher brothers on the site of a former dairy farm on what was then the edge of town, in a brand new “edge city” 2 miles north of downtown Phoenix (the area would later become known as Midtown Phoenix). At the time, the development was seen as overly speculative and foolish, and located too far from the city’s center of population–a seemingly laughable assumption today. 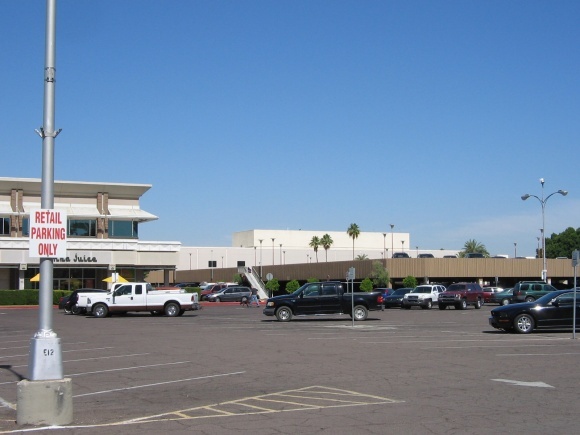 The mall, which is completely open air and always has been, opened in 1957 with three anchors: a two-level Goldwater’s (founded by the same family as former Republican presidential candidate and modern conservative godfather Barry Goldwater), a two-level Diamond’s, and a J.J. Newberry 5 and dime store. 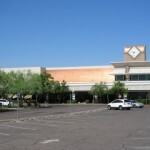 Laying to rest the initial skepticism about the mall’s potential, both Goldwater’s and Diamond’s soon both shuttered their downtown locations in favor of operating the new midtown stores as their main locations, and JCPenney also joined the roster as another anchor. 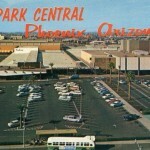 For a time, Park Central was the center of the Phoenix retail scene. 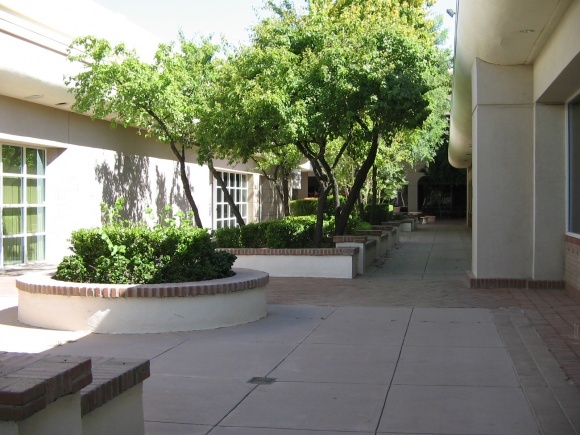 During the 1960s, a number of new high-rise office and apartment buildings sprang up in the immediate vicinity of the mall, pulling the city’s center of gravity north and quickly becoming the de facto “city center” of Phoenix. 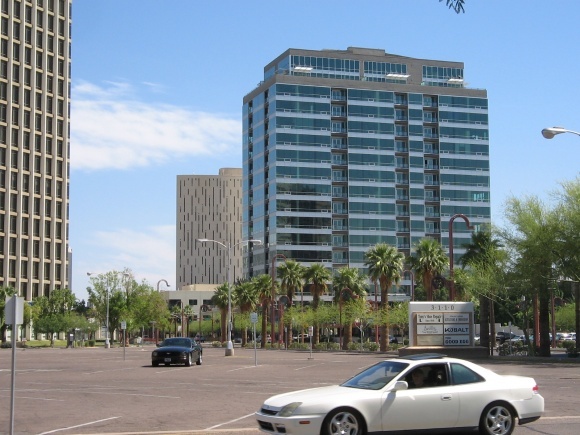 Phoenix exploded in population in the decades following world war II (and, realistically, continuing until only very recently), causing most development in the low-density, auto-oriented city to fan out for miles and miles in every direction. Due to these patterns, more people moved to far-flung newer regions of the city only partially accessible by freeways, and eventually the Midtown neighborhood came to be seen as slightly tired and inconvenient. 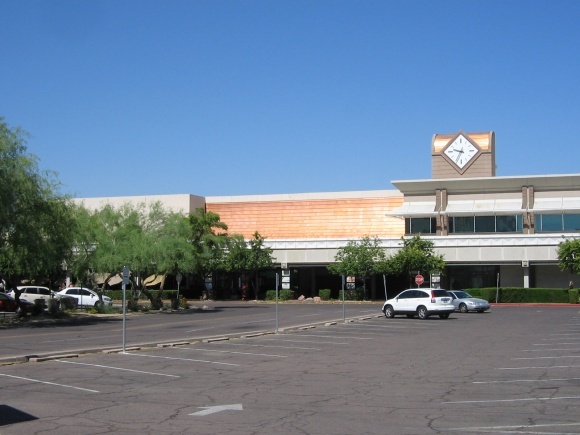 During this time, Park Central experienced the normal slate of changes that any major shopping center tends to see, mainly in shifts in tenants: Robinson’s replaced Goldwater’s and Dillard’s replaced Diamond’s, both sometime in the mid-late 1980s. 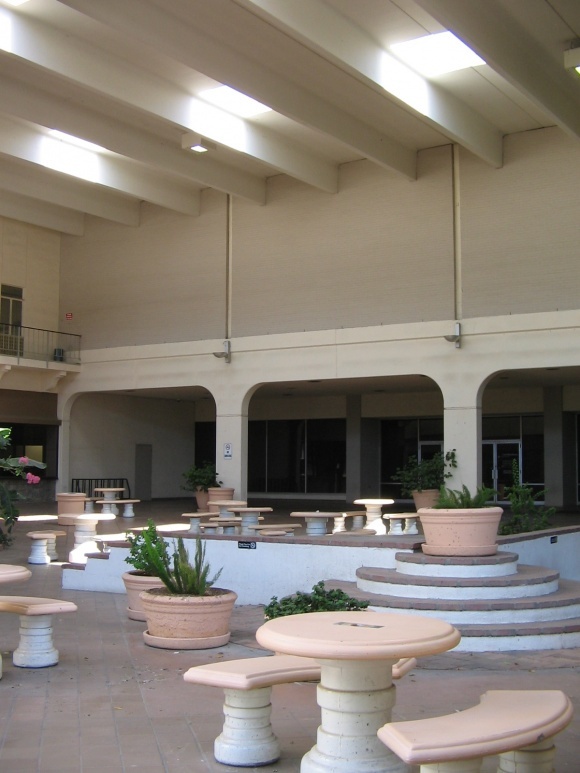 But by the end of the 1980s, Park Central was failing, losing many of its tenants to other, newer locations, and to enclosed, climate-controlled centers. 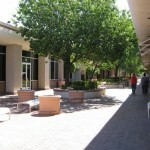 JCPenney and Dillard’s were the last of the anchors to leave, gone from the mall by the mid-1990s. Despite its failure as a retail center, the mall still sat at the very center of the city’s business district, surrounded by towering modern skyscrapers. 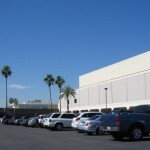 Realizing the potential of the property, the mall’s management began to convert the center to a mixed-use, office-focused facility not long after the closure of Dillard’s. 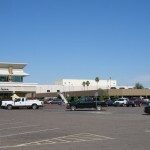 The former Diamond’s property became home to Catholic Healthcare West, Banner Health Systems moved into the Goldwater’s, and United HealthCare replaced the former JCPenney space. 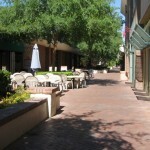 With so many office workers occupying the mall’s 3 largest spaces, some of the smaller spaces were able to be re-leased to low-level retail tenants, including Starbucks, Qdoba Mexican Grill, The Good Egg, and even a bevy of local businesses (including several small delis and even Kobalt, a gay bar). A Hampton Inn also opened on the corner of the property. 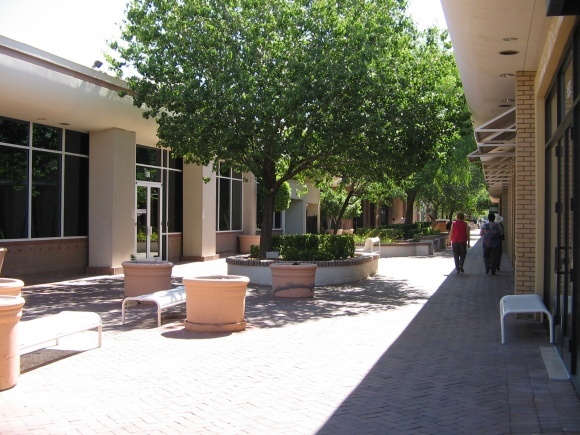 Although Park Central isn’t a mall by any definition now, the center has seen almost no cosmetic changes during its transformation and is completely open for perusing, so it’s a good opportunity to get a glimpse of Phoenix’s oldest retail establishment. It’s a little weirdly quiet now, and there aren’t any traces of old retail storefronts, but the facades on some of the original anchor stores are fairly neat and worth checking out if you’re in the area. 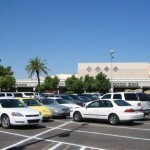 Also, the area itself has changed somewhat of late: while the mall failed in part because Phoenix had turned its eyes towards the sprawling suburbs, the city has seen (like many others) a revival in interest in urbanism, and a new light rail opened along Central Avenue in December 2008 giving direct transit access to the mall. Much of the dense and centrally-located Midtown neighborhood has become popular with young, upwardly mobile types who want access to nightlife and restaurants that aren’t just formula-based chains, and much of the city’s alternative culture thrives within blocks of Park Central (hence the mall housing a gay bar), so there’s even some remote chance that someday there will be a newfound interest in dense, pedestrian-oriented retail at the site. 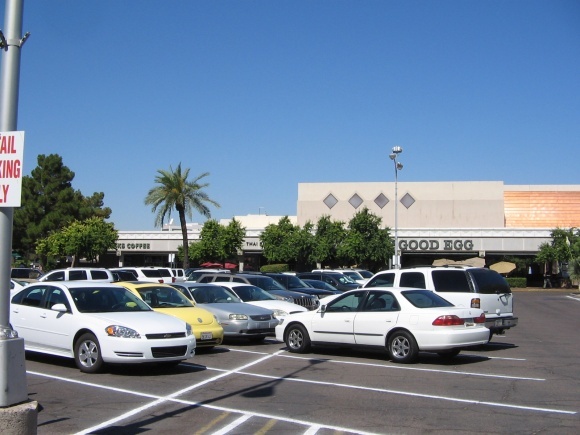 When I hit the Sonic the other day @ Power and Baseline, which is an outparcel of that outlet mall you’re thinking about, I had wondered if you covered it. 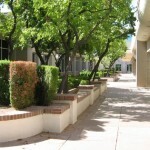 It’s much older than Superstition Springs and has had a couple name changes. When I was a kid, we referred to it as the VF Factory since that’s the main outlet there, but it’s most recent name change was Factory Stores of America to Power Square. It’s roof is still the original turquoise color though the road signs suggest the roof should be red. The one visit I’ve had to Park Central was sometime in the late ’90s after the mall’s conversion into a mixed use office/retail space. While Good Egg was closed (that type of restaurant usually closes around 2pm), Starbucks was jumping. 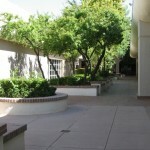 It was nice to see the complex was saved as other dying malls aren’t so lucky. 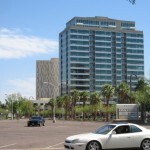 But then again, Phoenix today has skyscrapers in the downtown area along with government offices and buildings while the area Park Central is found has it’s own set of skyscrapers. Wow, this place had a Coffee Dan’s. Your thought that this mall may become more of a retail center in the future correct. 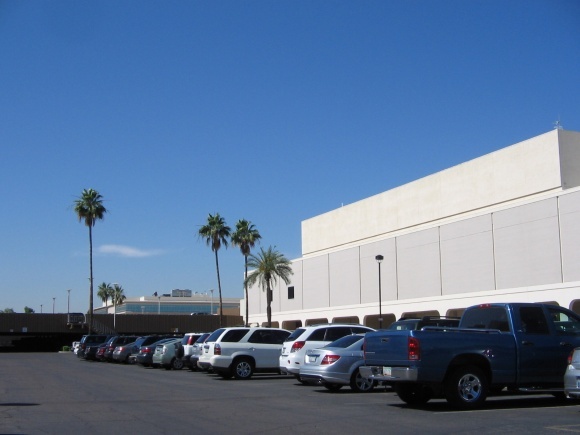 Some of the large Phoenix area mall developers have been looking at this property as a future retail redevelopment site with a lot of potential. Central Phoenix is actually under retailed compared with the rest of the metro area now and has been on the upswing demographically. 1. Poor street layout. It’s on a diagonal, main entrance facing AWAY from the street corner. An outlot in the triangle between the mall box and the intersection makes it very, very hard to notice. 2. Superstition Springs. VF/FSA/Power Square opened in 1986. Superstition Springs came in the 90s. Yes, it’s had all the name changes too. @Raymie, Was it ever fully alive? I don’t remember ever being there and seeing a full outlet mall. The VF outlet was the only large store and it always looked rundown. I remember brown carpet with duct tape marking the aisles. The layout of the place is odd. When they repainted the outside that brown color, the signs looks like the turquoise roof should have been painted red, but it never was. The parking lot on the east side looks like it was left to rot under the sun. Aside from Arizona Mills, the swap meet over at Signal Butte and Baseline is also popular, so I’m sure people are still skipping Power Square. Problem #4: The mall smells terrible. My last visit was right after the Power Square conversion and it still smells hideous, especially near entry 4. Nausea is not part of a positive shopping experience. 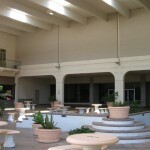 One of the former Park Central Department Stores has been the main office for United Health Care for about 10 years. My best friend works there and says that inside it is obviously a former Department store, but here’s the kicker: UNITED HEALTHCARE WILL BE VACATING ANY DAY NOW, as they are moving. Could it be that the management will pursue urban retailing again, such as Macy’s, Dillard’s, or Penney’s, all which were there years ago? (OK, Macy’s wasn’t there, but I think one of the former anchors eventually morphed into Macy’s) Or will they try to continue as a business park? It’s all still laid out the same as it was in the 60s, the fountains, though turned off, are still there. To anyone that hasn’t been to Park Central, GO!!! It’s all intact and you can see what it once was, even if you have zero imagination!